The disease entity of mixed connective tissue disorder (MCTD) is an enigma. The exact etiopathogenesis is unknown. Accelerated silicosis has been implicated as a causative agent. Our patient presented with accelerated silicosis starting as gradually progressive shortness of breath for about 1 year, progressing to chronic type 1 respiratory failure. This was followed by development of full blown MCTD, with combined features of rheumatoid arthritis, scleroderma and systemic lupus erythematosus with severe arthritis, myositis and joint contractures. 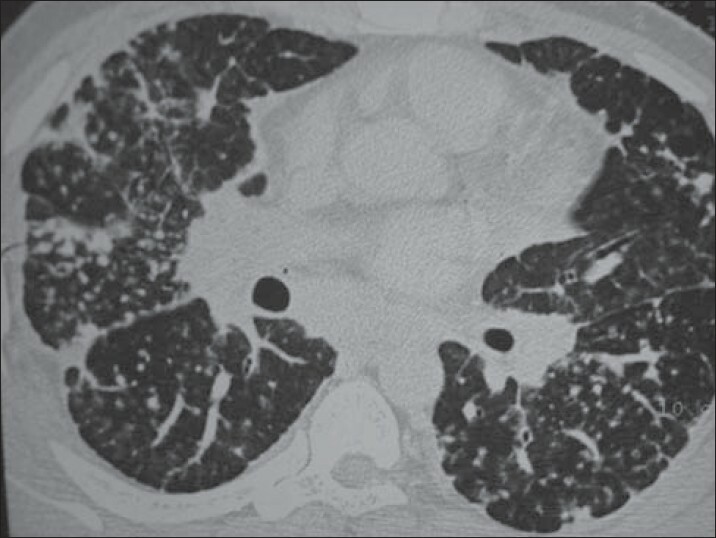 This was a case report of a 32-year-old stone crusher presented with gradually progressive breathlessness, initially on exertion and later, also at rest for 1 year. At the same time, he also noticed Raynaud's phenomenon involving the fingers and toes. Over the next 6 months, he developed a gradual binding down of the skin over the dorsa of hands, forearms, face and leg. There was history of recurrent non-painful oral ulcers. There was no history of prolonged fever, dysphagia, weight loss or photosensitivity. The patient also had severe joint pains predominantly involving all joints of the hands, including the wrist joint and the knees bilaterally. Patient had been working as a stone crusher for the past 6 years. On examination, the patient had diffuse hyperpigmentation, visible respiratory distress with a respiratory rate of 34/min with mild pallor. Examination of the respiratory system revealed extensive bilateral fine crepitations. Cutaneous examination showed binding down of skin of the face and all four limbs. Both hands had sclerodactyly. Laboratory investigations revealed a microcytic hypochromic anemia (Hb - 8 g%). Liver and renal function test were within the normal limits. The erythrocyte sedimentation rate was raised (80 mm/1 st h by Westergren method). Arterial blood gas analysis revealed type 1 respiratory failure with PaO 2 - 54 mmHg, pH - 7.38, PaCO 2 - 38 mmHg. Testing for immune markers revealed antinuclear antibody (ANA) positive-9 (IF assay), anti-double stranded-deoxyribonucleic acid positive, anti-Scl70 IgG antibody positive - 86 U/L, anti-U1 ribonucleoprotein (RNP) antibodies positive in high titers, anti-cyclic citrullinated peptide and rheumatoid factor positive. Skin biopsy from the trunk was compatible with systemic sclerosis. The chest X-ray revealed diffuse reticulo nodular shadows involving both lungs. Contrast enhanced computed tomography of the chest was suggestive of diffuse intra and interlobular septal thickening with fibrosis and randomly situated nodules [Figure 1]. X-ray of hands showed osteo acrolysis. Upper gastrointestinal endoscopy was normal. The patient was unable to perform pulmonary function tests. Mantoux test was negative. Fiberoptic bronchoscopy revealed normal airways. Bronchoalveolar lavage revealed a few neutrophils. Gram and acid fast bacilli testing of the sputum were negative. Transbronchial lung biopsy was compatible with silicosis and revealed focal interstitial fibrosis interspersed with pigment laden macrophages and refractile material. He fulfilled the Alarcon Segovia and Kusukawa diagnostic criteria for the diagnosis of MCTD. Patient was treated with oxygen. Low dose prednisonolone (20 mg OD) was given in view of the arthritis. Methotrexate at a dose of 25 mg weekly was also started along with proton pump inhibitors and physiotherapy. The patient responded to the treatment and his joint pains have regressed considerably. His hypoxia has also improved on therapy, but he continues to be on supplemental oxygen. Some patients have features of more than one rheumatic disease and thus do not fit into traditional classification. Patients with combination of clinical finding similar to those of systemic lupus erythematosus, progressive systemic sclerosis, polymyositis, rheumatoid arthritis and with unusually high titers of circulating ANA with specificity for nuclear RNP are considered to have MCTD. Hypotheses implicating modified self-antigens and/or infectious agents in the pathogenesis of MCTD have been advanced,  but none have been proven yet. Silica exposure has been implicated as a possible cause. Crystalline silica (quartz) particles less than 1 μ are the most pathogenic in silicosis. These particles are phagocytosed by macrophages and are transported to the regional lymph nodes. Though silica is chemically inert, it is toxic to the macrophages. When the macrophages die, the silica is released and is phagocytosed again. This constitutes a permanent stimulus for the fibroblasts, which increase their production of collagen leading to cutaneous sclerosis, vascular occlusion and pulmonary fibrosis,  which explains the myriad clinical features of scleroderma and MCTD. 1. Zdrojewicz Z, Budzyñ-Kozioł E, Puławska J. Mixed connective tissue disease - Etiology, pathogenesis, clinical significance, treatment. Postepy Hig Med Dosw 1999;53:751-66. 2. Hoffman RW, Greidinger EL. Mixed connective tissue disease. Curr Opin Rheumatol 2000;12:386-90. 3. Reiser KM, Last JA. Silicosis and fibrogenesis: Fact and artifact. Toxicology 1979;13:51-72. 4. Yáñez Díaz S, Morán M, Unamuno P, Armijo M. Silica and trichloroethylene-induced progressive systemic sclerosis. Dermatology 1992;184:98-102.